One of the newest spots on East Sixth Street, Revelry strives to give revelers an affordable, boisterous and inviting choice among the many watering holes in the area. I went for Sunday brunch and stayed for the drinks. Every aspect of Revelry Kitchen + Bar is on point. Here’s all you need to know before heading there. What I really like about the Revelry bar menu is the take on classic cocktails. You won’t see crazy concoctions with liquors you’ve never heard of that leave you guessing whether you’ll even like your choice. Instead, Beverage Director Alana Zanello plays with seasonal ingredients to keep the cocktail menu fresh and new. For example, during the winter months you can get a classic apple cider toddy with housemade cider. 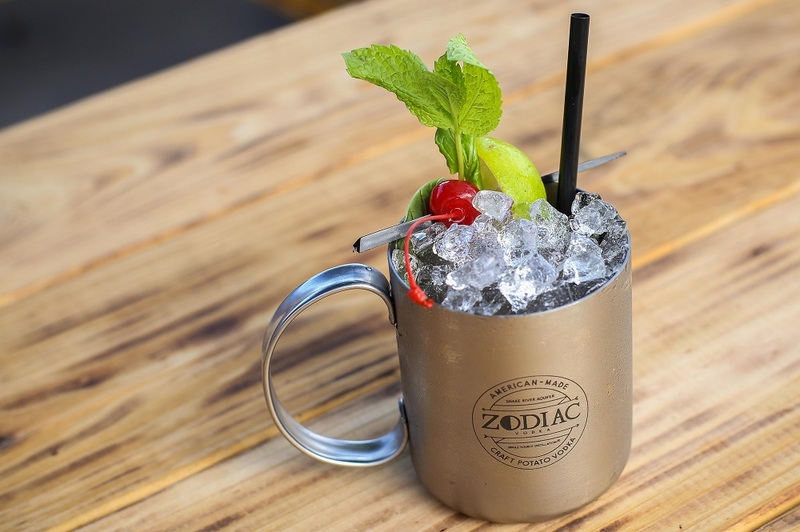 And since we love our limes in Austin, try the mint + cherry limeade. My personal favorite is the Final Countdown, a luscious drink made with espresso vodka, Ancho Reyes, orange liquor cream and shaved chocolate. Best of all? The drinks are affordable. I often hear people complain about how hard it is to find a decent cocktail under $10 in Austin. Well, here’s your spot! Where do I even start? The food here is varied and delicious. Revelry offers what looks like simple bar food at first glance. But instead of just wings, for example, you can order lollipop wings. For toppings, play it safe with traditional Buffalo sauce, or experiment with lemon pepper, Asian garlic and–my favorite–rendang sauce. This is a place where I can order anything on the menu, knowing it will be unique and tasty. I recommend you start with the hand-cut fries or shishito peppers. If you’re not feeling venturesome, stick with the tacos–both chicken and beef options are yummy! And if you’re looking for something you can’t get anywhere else, order the katsu burger. It includes a cheddar-stuffed, breaded chicken breast topped with Japanese mayo, hoisin and pickles. Basically anything you order will be amazing because nothing here is frozen. Revelry Kitchen + Bar is only open for dinner right now, but keep an eye out for extended hours and lunch options to come. One of my favorite meals of the day is brunch, not only because it allows me to mix my OJ with alcohol sans regret, but also because I can eat sweets with my eggs. So what’s the twist here? Music. 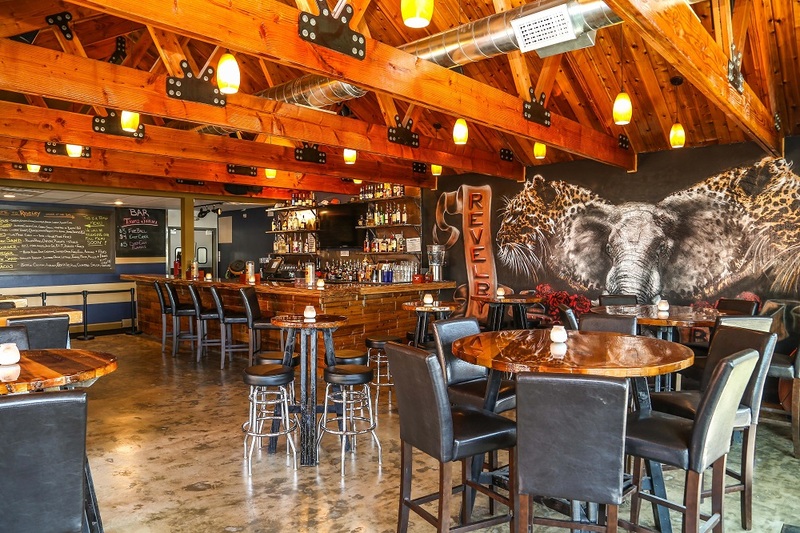 Revelry Kitchen + Bar pairs the Bloody Mary bar with a DJ mixing chill tunes as you eat. Music is a part of our city’s soul and they don’t forget that at Revelry. 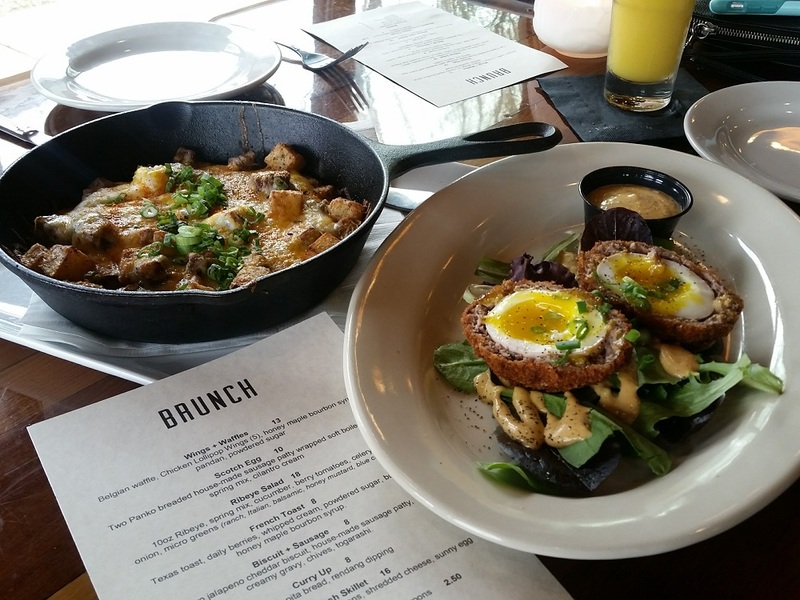 This Sunday brunch includes favorites such as French toast and breakfast tacos, but they also play on the classics with wings + waffles and breakfast beignets. Or if you’re feeling more adventurous, try the Scotch egg which is basically a soft-boiled egg wrapped in a housemade sausage patty. Revelers need not fret. In addition to the Bloody Mary bar, you can get carafes of mimosas and my favorite, a lavender pisco sour. My favorite happy hour day of the week is probably Monday, since it lasts all day long at Revelry Kitchen + Bar! I think they’re trying to make Monday Austinites’ favorite day of the week, and they might succeed. $3 tacos on Monday! 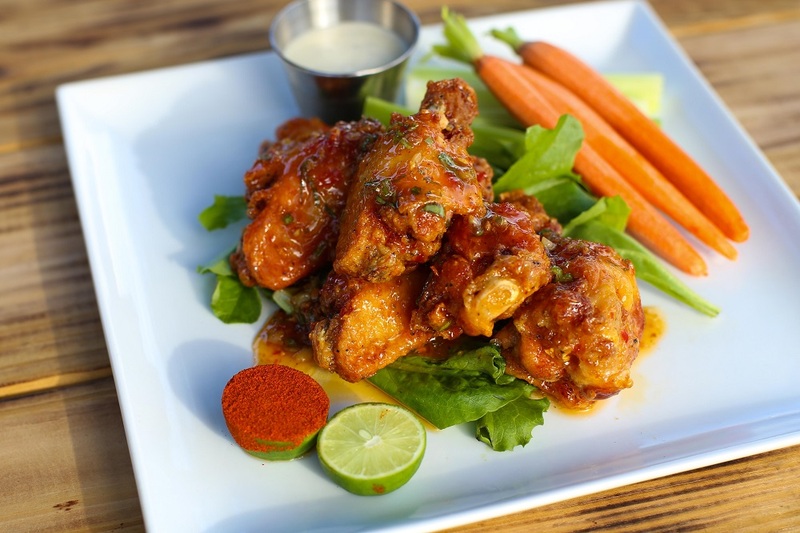 Another happy hour favorite is Wednesday with Wine and Wings specials. I can attest that a glass of rosé with wings smothered in rendang sauce makes the perfect pairing. 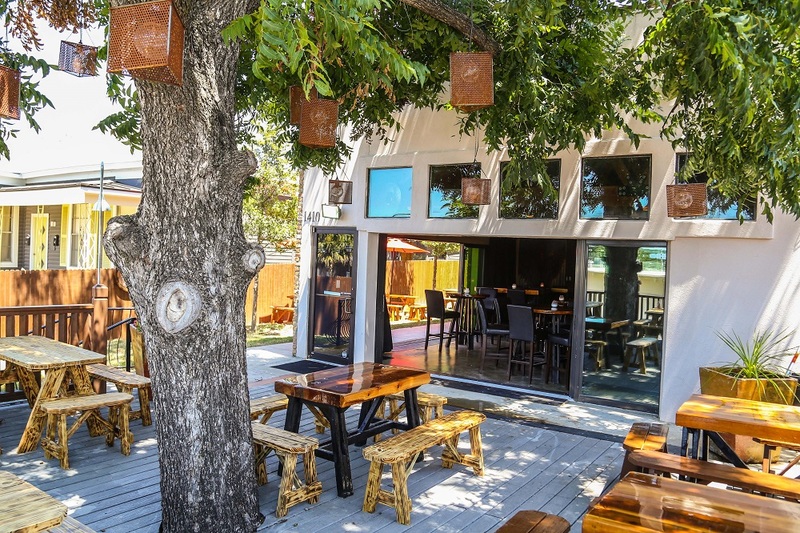 Not only will Revelry Kitchen + Bar win you over with food and drink, but their outdoor patio, bar games and six TVs will win over your inner child who just wants to come out and play. Swing by the next time you’re on East Sixth. What attracts you to a new bar: food, drinks or ambiance? Disclosure: Revelry Kitchen + Bar provided me with complimentary food and beverages for the purposes of this review. All opinions are my own.